So I finally had some time to work on the car. Yay! I’ve just about got it completely stripped and ready for the cage (I think). I removed all the glass, minus the windshield of course. Also removed the rear window. And by removed I mean broke accidentally. That thing was a pain. I had to use my flat bar and mallet to remove the adhesive. Used the saw to cut out the doors in order to make room for the cage door bars. Now I just have to figure a few things out about the heater and A/C unit, get them out. Clean up some wires and get her to the cage builder. Also need to change out the ball joints and stuff. I still haven’t replaced those yet. The parts have been sitting in my garage for a couple of months though. Anyway, figured it was about time for an update. The FedEx delivery man brought me some goodness today! 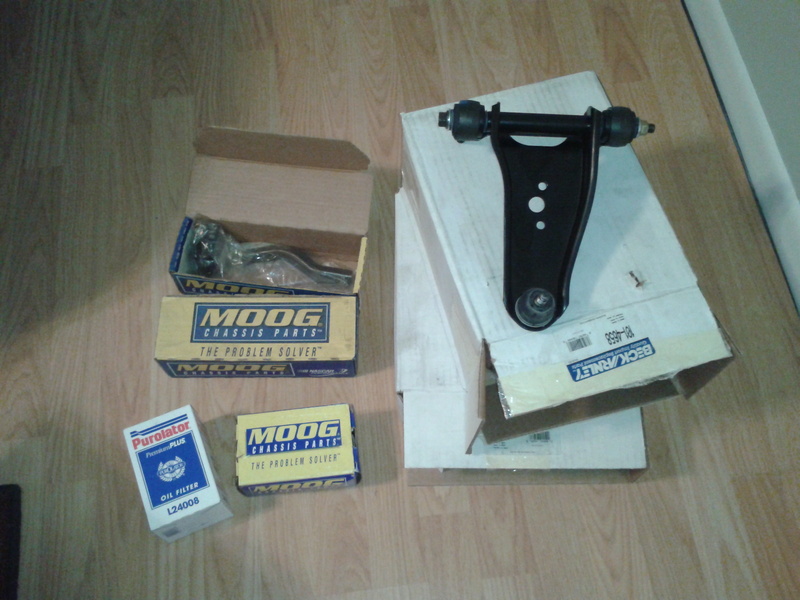 From left to right: Purolator oil filter, 2 MOOG front outer tie-rod ends, 1 MOOG front lower ball joint (still waiting on the other), and 2 Beck Arnley upper control arms with bushings. Once the other lower ball joint gets here I will work on installing these. Hopefully I can get it started before I leave on the 9th for training for my new job.